Getting started with the new integration cloud, the cloud that brings ICS, VBCS and PCS together. 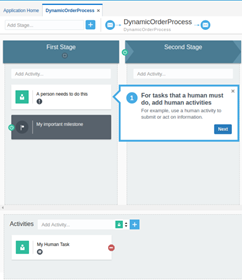 But it also includes the introduction of dynamic processes, Oracle’s new approach for adaptive case management. This introductory blog consists mainly of an overview of the different parts of dynamic processes. In addition, some differences between PCS and the Integration Cloud are discussed. First step: import the Jarvis Pizza Preparation application. The location of this menu option is changed but the functionality is not. So we do this in two quick steps. Read the complete article here.